There was a huge accident at the lab when Johnny went to the cloning machine and now the aftermath is terrifying. Stop the waves of clones building the defensive cannons near the conveyor and save the proton. 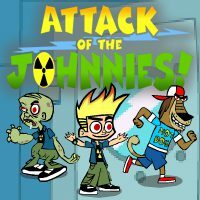 Defend your lab from the clones of Johnny by building the defensive towers with their own special attacks. Freeze the clones and slow their movements or build the rocket tower that can deal damage on the area. Place them smart and upgrade towers when you have upgrades available.